MCFA donation boxes can be found at fine merchants throughout the area. 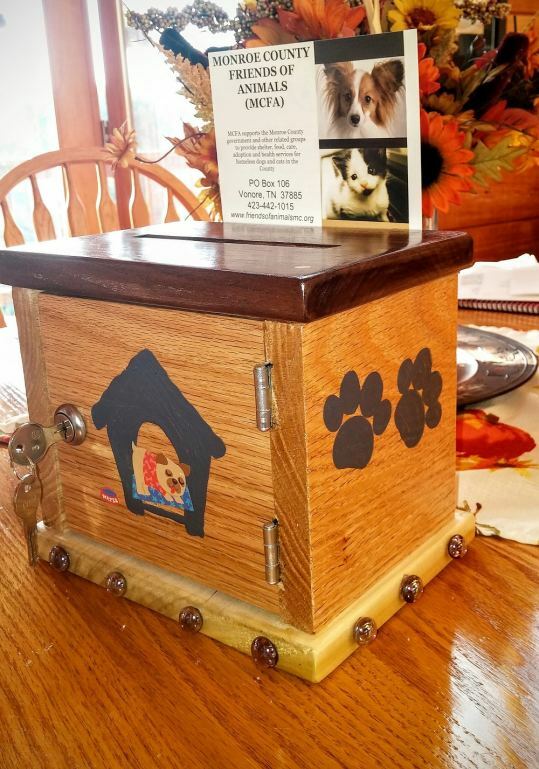 MADISONVILLE, Tenn. - Feb. 2, 2017 - PRLog -- Generous merchants place specially designed Monroe County Friends of Animals donation boxes in strategic locations to help homeless cats and dogs in Monroe County. Pam Crays, Fundraising Chair for the organization said, "We are very appreciative to the businesses who are helping us by placing Friends of Monroe County donation boxes in their establishments. The donations that generous patrons of the businesses make will be help us fulfill our mission"
Crays said, " On behalf of all the pets who will be served by the money donated, via these boxes, thank-you so much. " Dale Polewach, President MCFA Board of Directors wrote "I thank Norm Coe of the TV Woodworkers Club for volunteering to build the collection boxes that are now distributed at fine merchants who support us throughout the area. Thanks to Norm's effort, donors and these merchants MCFA has already collected hundreds of dollars we might not have otherwise have collected." Merchants, foundations, or private donors who are interested in supporting Monroe County Friends of Animals can contact the organization at pamcrays@reagan.com and request information on how they can help MCFA with a donation box, or donations or by volunteering. About Monroe County Friends of Animals: http://friendsofanimalsmc.org/ MCFA is a not-for-profit volunteer organization with 501(c) (3) status located in Monroe County, Tennessee. This group was created in 2004 by concerned citizens who recognized a dire need existing throughout the county for animal welfare. They consulted with the County's governing body and entered into negotiations with the Monroe County government. This led to the formation of a county-run animal shelter, which was approved by a narrow commission vote at the end of 2004. The main thrust of MCFA's mission is to support the Monroe County Animal Shelter both monetarily in animal rescue efforts and with hands-on assistance in the shelter. In addition, MCFA provides other community services through its volunteers' network. MCFA is a nonprofit, volunteer organization dedicated to helping Monroe County give pets the lifesaving care they need.